Due to plans for a major renovation at the Sunnyside Pavilion the Sunnyside Beach Art Show is cancelled for 2014. 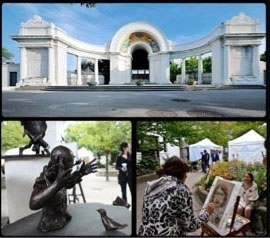 Join us for our sixth annual Sunnyside Beach Juried Art Show that takes place from May 31- June 2, 2013 on Toronto's west-end waterfront inside one of the city’s architectural gems, the historic Sunnyside Pavilion. The three-day art event brings together acclaimed emerging and established painters, sculptors, illustrators, and photographers, alongside art installations and live music performances. We also provide activities for the whole family that include art workshops for kids (hosted June 1st and 2nd on a drop-in basis) and large-scale live collaborative painting and drawing under the guidance of artists. Whether you are an art enthusiast, collector or first time buyer, we invite you to meet and support practicing artists. The art show begins Friday, May 31st at 4 pm and runs all weekend. Admission is free. We have been taking over the ground floor and upper level of the Sunnyside Pavilion since 2009. And have been delighted by the support of the local arts community as well as our politicians, Parkdale-High Park MP Peggy Nash, Parkdale-High Park MPP Cheri DiNovo and City Councillor for Ward 13 Sarah Doucette. During each show, a jury of distinguished professionals from the field of the arts in Canada selects our award winners that includes the First Place Award for Outstanding Artist, a $1000 cash prize generously sponsored by Dara and Marvin Singer. Our 2013 prize selection jury includes: Edward Gajdel, celebrated portrait and art photographer, Jennifer Leskiw, art consultant, Jennifer Leskiw Contemporary and Walter Williems, co-founder ArtBarrage.com. Visitors to the show are invited to vote for the People’s Choice Award, a $500 cash prize presented to the show’s favourite artist. Credited with bringing fresh ideas and creativity to this lakefront landmark, the show attracts art collectors and cultural enthusiasts from across Toronto, providing a destination that feels like a weekend getaway inside the city. Visit us during the first weekend of June and begin a new season on the Toronto waterfront with the Sunnyside Beach Juried Art Show, a free, family-friendly event that operates rain or shine. Find out more about who we are and what goes on by viewing our official show catalogs, visiting our photo gallery and media page, and by following us on Facebook and Twitter for the latest updates. For the first time last year, we invited participating artists and visitors to the show to create a live large-scale painting. Inspired by Sunnyside Pavilion and its surroundings, a white canvas was transformed and is now our official 2013 show banner. Our warmest thanks to all who picked up a paintbrush! Want more of the show?